Statutory information – This information should be thoroughly checked before submitting your application. Failure to lodge this information, which may include background checks and other requirements, may result in your application being rejected. Qualifications and experience – Qualifications requirements tend to vary, from high school diploma to various types of educational certification. If you’re not sure, check with the employer. In different Teacher Assistant roles, you’ll be required to have relevant experience in context with the requirements of the position. Name/ and contacts – Your full name, and at least one reliable contact, phone/ email. Introduction/ summary/ objectives – This part of your resume is an introduction to yourself, describing your work and role. Skills – This is an extremely important part of your resume. You must list your skills to meet all requirements of the position. Cross check your resume for good matches to essential criteria and desirable job skills. Formal qualifications – Be careful to ensure that your qualifications are acceptable to the employer. If not, you can waste a lot of time making an application which will have to be rejected. Employment history – As part of your resume, you’ll need to show the employer a range of skills related to the needs of the new job. Think about your experience, and refer to required skills in this part of your resume. 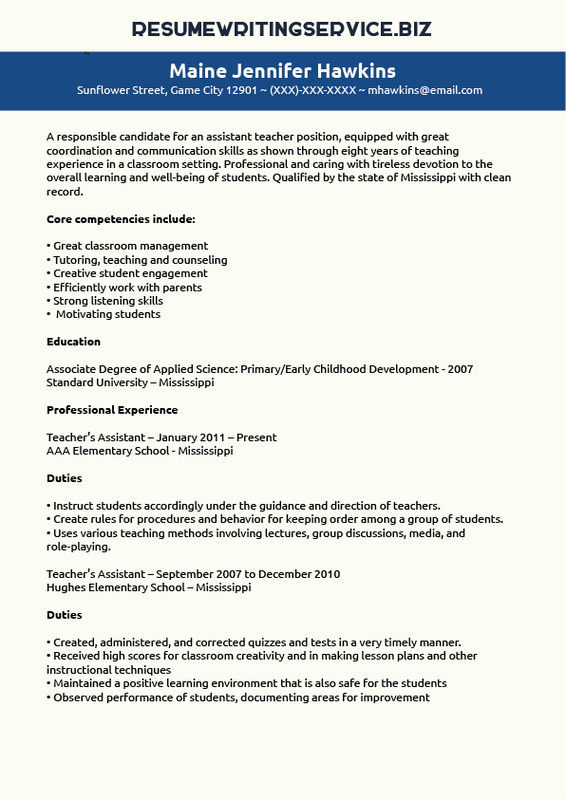 Whether it’s a teaching assistant or preschool teacher resume, do not use a One Size Fits All resume. Every job has its own needs. Your resume should be customized to the job. “Targeting your resume” means writing it specifically for a particular job. Using a functional resume in the format above, this is quite easy, just make sure you really do address all the requirements of the job. Skills – Show high value skills suitable for the role. Use your strongest skills as performance indicators to show that you have the competencies required for the job. Experience – Make sure you cite relevant experience, directly related to required skills. Teachers don’t want to guess whether their assistants can do the job – They need competent people. Make it clear that you have the right experience, and can show strong credentials for the job. For more information about becoming a Teacher’s Assistant and career information, see the Bureau of Labor Statistics page here at http://www.bls.gov/ooh/education-training-and-library/teacher-assistants.htm or use our resume writing service. Anticipated growth in jobs for kindergarten teachers in the US in the coming decade to 2022 is 6%, or 105,000. This rate of growth is equivalent to the average national job growth rate over this period. Please note that distribution of positions will vary considerably depending on location and demographic demand. If you need instant help with an assistant teacher resume, feel free to contact us!